Cold Pursuit is not Taken. It’s not any of Liam Neeson’s action-thrillers, and it’s not trying to be. If anything, Cold Pursuit, Hans Petter Moland’s adaptation of his 2014 Norwegian film In Order of Disappearance, is a parody of the revenge film that has little patience for characterization or relationships. Rather than dive into the interior lives of its characters, Cold Pusuit relishes the thinnest of motivations to rack up a body count. Moland and screenwriter Frank Baldwin revel in the absurdity of the revenge movie, and they make the most of poking fun at its conventions in darkly comic fashion. If you’re expecting a straight-faced thriller, you won’t find it here. Instead, you’ll have a blast watching Moland toy with the genre. Nels Coxman (Neeson) is a snowplow driver and Kehoe, Colorado Citizen of the Year. He lives a simple life with his wife Grace (Laura Dern) until their son Kyle (Micheál Richardson) turns up dead from a drug overdose. Nels knows his son wasn’t an addict, and his suspicions are confirmed when he learns that Kyle was actually murdered by a gangster named “Speedo” (Michael Eklund). 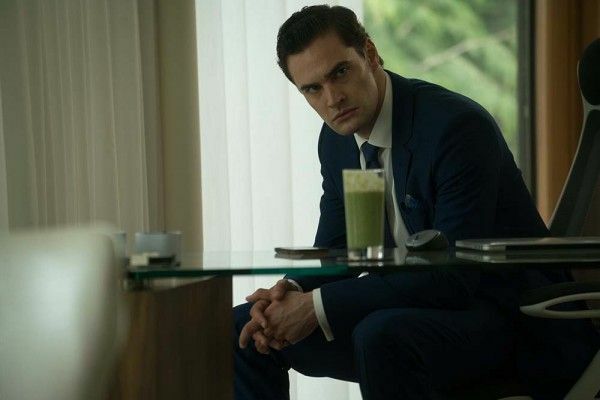 This leads Nels up the ladder of criminals, who are led by the health-obsessed “Viking” (Tom Bateman). Nels’ actions end up igniting an all-out turf war between Viking’s men and the local Native American gang. Meanwhile, local detective Kim Dash (Emmy Rossum) and her partner Gip (John Doman) are always about three steps behind in following this bizarre series of events. For some, it may take a few moments to get on Cold Pursuit’s wavelength. After all, there’s nothing funny about grief-stricken parents who have just lost their only son to an apparent drug overdose. But for Cold Pursuit, the joke is that any vigilante justice is possible outside of movies. You can’t take a snowplow driver getting revenge against an entire criminal syndicate seriously, so Moland doesn’t even try. Instead, he hammers away at the dark comedy from the whimsical score and visual choices to heighten the comedy. For example, in the scene in the morgue where Nels is grieving over his son, Moland shoots it so that when someone hands him his son’s things, you just see an arm holding a bag come into frame. It’s meant to be funny, and so is the rest of the movie. Once you accept Cold Pursuit as the dark comedy that it is, the film is a blast where its only real hurdle is in how to keep the story going. If you just have Liam Neeson murdering thugs one-by-one for two hours and disposing of their bodies, that gets repetitive. In order to keep the movie funny, the plot has to sprawl outwards, bringing in Nels’ brother and former criminal Brock (William Forsythe), bringing in the Native American gang, bringing in the only two cops working on a series of murders, and so forth. For Cold Pursuit, intimacy is the enemy. You never know Kyle as a person or really even Nels. Their relationship is defined only as “father and son”. For Moland, the comedy is in the canvas, and if you try to make it personal and specific, then you have to ditch absurdity and go for reality, which this movie does not want to do. 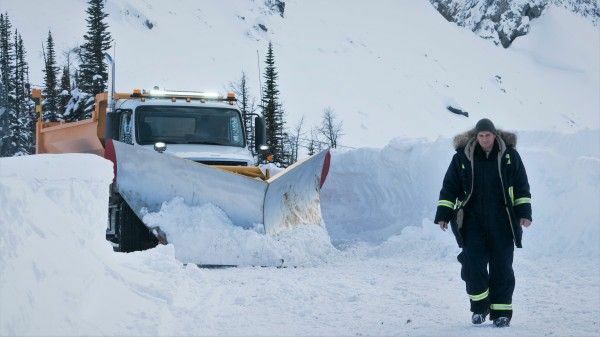 Everything Cold Pursuit does is to mock the genre and the glamour of criminality. All the criminals have silly nicknames, and you can’t help but bust out laughing when Neeson growls “Where do I find this Santa?” When Nels has to call in a hitman for help, he puts the guy up at a dingy motel because there’s a convention in town and all the nice hotels are booked. One of Viking’s hitmen plays Fantasy Football, but also wants to put Cleveland Browns players on his team out of loyalty, which is both hilarious and sad. Cold Pursuit comes right up to the line of being a thriller spoof and then spits over the line. One could argue that Cold Pursuit is much longer than it needs to be, and I can see that argument. All of the energy of the film comes from Nels, and when you leave him, you either rely on the scenery-chewing Viking (and, to be fair, Bateman is a lot of fun in the role), the cops, or you’re with the Native American gang. For a movie that hits the ground running, it’s odd to see it slow down for plot reasons before picking back up with the next ridiculous death. And ridiculous death is the heart of the movie. I can easily see Moland watching Neeson run around a Taken film and think, “Who are all of these people he’s killing? Sure, they’re criminals, but isn’t this taking things a little far?” Most revenge thrillers have an element of the absurd inherent in the nameless thugs who get mowed down. Cold Pursuit just has the bravado to lean into the absurdity.